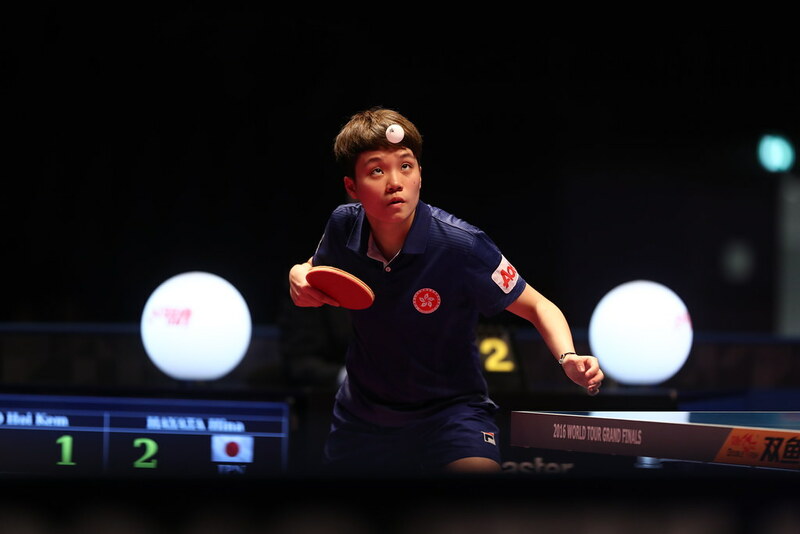 Winner in Hungary earlier in the year and on home soil in Korea, Lim Junghoon survived but of the top ten names on duty in the Under 21 Men’s Singles event at the Seamaster 2017 ITTF World Tour Platinum Lion Japan Open in Tokyo, on Wednesday 14th June, the remaining leading names all perished. He was the only member of the elite to reserve a semi-final place as the host nation’s Tonin Ryuzaki and Masaki Takami alongside Germany’s Qiu Dang caused upset after upset. Determining which player caused the biggest surprise is no easy task but if one player delighted to home fans, it was Tonin Ryuzaki. Successful on the ITTF World Junior Circuit in Sweden and Hungary in 2014, the no.11 seed; after recovering from a two games to nil deficit against Chinese Taipei’s Lin Yun-Ju, the no.21 seed (7-11, 6-11, 11-7, 11-5, 11-3), he caused Hong Kong increasing pain. He accounted for Lam Siu Hang, the no.5 seed (12-10, 14-16, 11-9, 11-3) before recording a quarter-final success against Ho Kwan Kit, the top seed, in tense five games duel determined by the very narrowest of margins (8-11, 11-7, 6-11, 11-9, 11-9). However, of the players to cause the surprises, Tonin Ryuzaki was the highest rated; Qiu Dang started proceedings as the no.18 seed, Masaki Takami, the no.22 seed. Qiu Dang after beating Andrea Landrieu of France, the no.9 seed (11-7, 11-3, 11-9), overcame Russia’s Konstantin Chernov, the no.20 seed (11-13, 11-5, 13-15, 11-9, 11-4) and Korea’s Cho Seungmin, the no.3 seed (14-12, 6-11, 6-11, 11-7, 11-9) to reserve his semi-final place. A fine win over Cho Seungmin but it was an equally impressive performance against Konstantin Chernov; the Russian was a man in form, in the opening round he had beaten the host nation’s Yuto Kizukuri, the no.20 seed (11-8, 6-11, 11-9, 4-11, 12-10). Meanwhile Masaki Takami emulated Tonin Ryuzaki. He caused Hong Kong problems. In the opening round he beat Ng Pak Nam, the no.13 seed, the young man who had reached the third round of the Men’s Singles event at the recent Liebherr 2017 World Championships in Düsseldorf. Impressively Masaki Takami won in three straight games (11-5, 11-4, 11-8). Confident, Masaka Takami progressed to beat colleagues Haruki Miyamoto, the no.24 seed (11-9, 11-7, 7-11, 11-9), before causing a major upset by overcoming a further compatriot in the guise of Asuka Sakai, the no.4 seed, by the narrowest of margins (I11-6, 3-11, 9-11, 11-9, 12-10). Notably in the opening round Haruki Miyamoto had beaten Korea’s Park Ganghyeon, the no.8 seed (17-15, 4-11, 10-12, 11-4, 11-8). Meanwhile, whilst all around there was carnage; Lim Junghoon progressed but not without moments of concern. A direct entry to round two, he overcame Chinese Taipei’s Yang Heng-Wei, the no.15 seed (11-7, 8-11, 11-8, 13-11) prior to needing the full five games to end to hopes of the host nation’s Kazuhiro Yoshimura, the no.7 seed (9-11, 11-9, 15-13, 8-11, 11-7) to book at his semi-final place. In the penultimate round Tonin Ryuzaki meets Qiu Dang, Lim Junghoon opposes Masaki Takami; the event will be played to a conclusion on Thursday 15th June.